Secretary-General Ban Ki-moon today announced the appointment of Lenín Voltaire Moreno Garces of Ecuador as his Special Envoy on Disability and Accessibility. In his new post, Mr. Moreno will help promote the rights of people with disabilities, who number more than one billion, and also advocate on behalf of accessibility for all people. “In spite of the remarkable advances toward accessible and disability-inclusive societies an enormous gap remains between the commitments made and the daily experiences of persons with disabilities,” the appointment announcement noted. 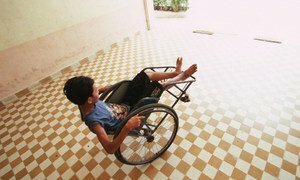 About 15 per cent of the world’s population lives with some form of disability, and those persons face physical, social, economic and attitudinal barriers that prevent them from effectively participating in society. Mr. Moreno currently serves as Chairperson of the Committee for the Elimination of All Forms of Discrimination against Persons with Disabilities of the Organization of American States. The former Nobel Peace Prize nominee is a globally acclaimed advocate for persons with disabilities and inclusive society. “Under his leadership as Vice-President, Ecuador greatly advanced social inclusion and integration of persons with disabilities in national development efforts as well as in regional and international cooperation,” Mr. Ban noted, referring to the post of Vice-President of Ecuador which Mr. Moreno held from 2007 to 2013. The UN marked the International Day of Persons with Disabilities on 3 December, with calls for global efforts to ensure that the more than one billion people worldwide who live with some form of disability can reap the benefits of development and fully participate in society. In September, at the first High-level Meeting of the General Assembly on Disability and Development, countries adopted a landmark outcome document seeking to promote development initiatives that take into account the needs of persons with disabilities. The theme for this year’s International Day – ‘Break Barriers, Open Doors: for an inclusive society and development for all’ – sought to build on that commitment, particularly important as countries prepare to shape the next development agenda that will follow the Millennium Development Goals after their 2015 target date. Marking the International Day of Persons with Disabilities, the United Nations is calling for global efforts to ensure that the more than one billion people worldwide who live with some form of disability can reap the benefits of development and fully participate in society.